This guide has a complementary tutorial video. System Manufacturer – Dell Inc. I do not recommend downloading the BIOS update from Dell Drivers and Downloads because sometimes BIOS updates require older BIOS as a prerequisite. e.g. the attempted update from A03 to A12 may state that A06 should be installed before A12. Dell Drivers and Downloads only lists the latest revision whereas the Dell FTP website lists all the revisions for the model. If your system is not a Dell get the driver from your appropriate OEM for instance HP or Lenovo. Press [Ctrl] and [ f ] on your browser this will open up the search on the page. You will see the latest revision at the top and all subsequent versions Dell released. In the case of my XPS 8300 it already has version A06 and hence is up to date. So theres no need to attempt update. Note the release date on this page may be slightly different to the date of the BIOS revision on system information because it takes Dell some time to test the update before they make it public. If you have a BIOS revision lower than the latest version. 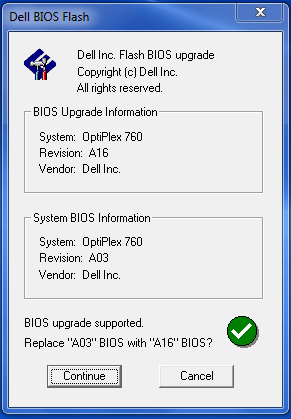 For example on an Optiplex 760 which had BIOS revision A03 significantly out of date compared to the latest A16 release. Select the download button and then select Save. Do not select run as you shouldn’t have background programs when running the BIOS update. In most cases it will not work anyway as the BIOS update needs elevated permissions. I advise moving the downloaded update from Downloads to the Desktop. The BIOS update is a firmware update. This type of update updates the firmware for your system BIOS. You launch the BIOS update within Windows but the computer restarts and updates the BIOS within BIOS. Therefore once a BIOS update is applied it remains applied even if Windows is reinstalled. As the BIOS update has the potential to change the functionality of your hardware, additional security measures are put into place to make sure that you actually want to run the BIOS update. Note An incorrect BIOS update has the potential to kill your computer entirely. Before updating the BIOS its advisable to make sure all programs are closed. Right click the BIOS update and select run as an administrator. The BIOS update will then launch and tell you what revision you have and what revision the BIOS flash is. The computer will then restart and restart the BIOS update. DO NOT DISTURB THE COMPUTER DURING THIS TIME and certainly do not cut power. If you do then likely you will kill the computer entirely. Once the computer loads into Windows some of the BIOS updates will re-launch automatically but then will tell youthat you have the latest version already so just click cancel. You may then delete the BIOS update from the Desktop. Some BIOS updates may require perquisite BIOS updates as mentioned. Try to update the BIOS in the least number of steps. For optimal performance Windows 10 TH2 should be clean installed using a UEFI BIOS with SecureBoot enabled if your computer has these technologies. The Bootable USB should be formatted as GPT partition scheme for the UEFI BIOS using Rufus. What is Basic Input Output System (BIOS)? Basic Input Output System (BIOS) as the name suggests is the very basic Operating System embedded into your systems i.e. firmware. The BIOS setup allows you to change some of your hardware settings and to boot from installation media with a proper Operating System e.g. Windows 10. Associated with BIOS is the Unified Extensible Firmware Interface (UEFI) which is essentially a modern more advanced version of BIOS that has increased functionality and additional security. Because of the strong connection and familiarity of end users to BIOS this is usually denoted UEFI BIOS and not just UEFI. This is the legacy partition table associated with BIOS. It has the limitation of a maximum of 4 partitions and also a maximum drive capacity of 2 TB. Moreover because there is a single Boot Record if this becomes corrupt the Windows OS will be corrupt and need to be repaired from installation media (possibily resulting in data loss). What is GUID Partition Table (GUID)? This is the revised partition table and requires a UEFI BIOS. It allows up to 128 partitions and supports drives larger than 2 TB. Because this partition table can create a large number of partitions it does not restrict users like MBR and allows the Windows 10 OS to make both a primary and secondary Boot Record. If the primary Boot Record becomes corrupt it can easily automatically be fixed using the secondary boot record making it more robust. What is SecureBoot and why Should I use it? This is a firmware security technology and requires a UEFI BIOS. The advantages of SecureBoot are covered in this schematic. Essentially its a firmware protection feature when SecureBoot only Microsoft verified code is allowed to boot which means Windows 10 loads alongside its inbuilt security processes before any nasties get a chance to load. Conversely when SecureBoot is disabled the nasties may load before Windows disabling any inbuilt Windows 10 Security features from loading leaving your computer computer vulnerable to attack. Note although this guide is focusing on Windows 10, Linux Ubuntu, Linux Mint and Linux Fedora instalaltion media have all been updated to pass SecureBoot. Likewise utilities such as Acronis. All Windows 8 and later computers have a UEFI BIOS and both UEFI and SecureBoot should be enabled from the factory. You can confirm this by looking at your system information if your BIOS Mode is UEFI and your SecureBoot State is On you likely have Windows 8 64 Bit or later preinstalled and hence already have the optimal settings for proceeding with a Clean Install of Windows 10 64 Bit TH2. For such configurations you do not need to check your UEFI BIOS setup. If you had Windows 7 preinstalled instead of Windows 8 or later or manually Downgraded to Windows 7 yourself SecureBoot will have been Disabled as Windows 7 installation media was never updated past 2011 and hence not verified by Microsoft to pass SecureBoot. Moreover Windows 7 may be installed using the MBR partition scheme with the legacy BIOS setting applied. If you have UEFI and SecureBoot enable both and install Windows 10 using the GPT partitions scheme. Note there are a handful of early UEFI systems that have a UEFI BIOS without SecureBoot. It should be noted that systems have came preinstalled with Windows 7 as early as 2009. As a rule of thumb systems with a BIOS revision <2011 won’t have a UEFI BIOS and Windows 10 will have to be installed in MBR. There is a grey area for 2011 systems. If your system BIOS revision is >2011 and you don’t have these settings enabled you should check the BIOS setup to see if they are supported. SecureBoot will be disabled in systems that have Windows 7 loaded for instance as Windows 7 doesn’t support SecureBoot. I advise exiting the BIOS without saving changes so you can prepare a Windows 10 TH2 bootable USB with the appropriate settings on your current Windows installation. Once you have made the Windows installation media you can then adjust the BIOS settings to the optimal settings your hardware supports. To enter the BIOS setup Power Down your computer. Wait 10 seconds and power it up. Press F2 at the Dell BIOS Screen. Other OEMs may have a different key sequence. Example 1 of an Inspiron 13 7347 BIOS. The Boot list mentions SecureBoot and UEFI. Both are enabled. The Bootable USB should be formatted as GPT partition scheme for the UEFI BIOS. The system can take advantage of the GPT scheme and preboot security. Example 2 of a Latitude E5510 BIOS. The Boot list mentions UEFI but not SecureBoot. UEFI is supported but secureboot isn’t. There is no option for SecureBoot. The Bootable USB should be formatted as GPT partition scheme for the UEFI BIOS. The system can take advantage of the GPT scheme but not the additional preboot security. Example 3 of a XPS 8300 BIOS. The Boot list does not mention UEFI or SecureBoot. Both these technologies are unsupported. There is no option for UEFI. The Bootable USB should be formatted as MBR partition scheme for the Legacy BIOS. The system cannot take advantage of the GPT scheme or additional preboot security. The cost of large enough capacity Solid State Drives to use as a Windows Boot Drive is now economic and so replacement of your old mechanical Boot drive with a Solid State Drive is now recommended for systems with only one Hard Drive bay. This will give your system a marked difference in system performance. For maximum performance its advised to upgrade to a 250 GB or superior Solid State Drive and to use this SSD as a Boot Drive with no additional caching. To determine how feasible this upgrade is on your system you should refer to your Service Manual or Owner’s Manual which instruct in the removal of the drive(s). This can again be found on Downloads.Dell.com I advise searching for en-us when on your models page. Most Dell systems are well designed so that accessing the HDD/SSDs is pretty straight forward. You can use the Crucial System Scanner to scan your system for compatible SSD upgrades. Some more details are available in Upgrading to a SSD Drive. Once you have ordered your SSD ensure that you have Downloaded Windows 10 TH2 Installation Media and made the Bootable USB. Once you have your SSD installed and your computer is back together you should check the SATA operation in your (UEFI) BIOS. 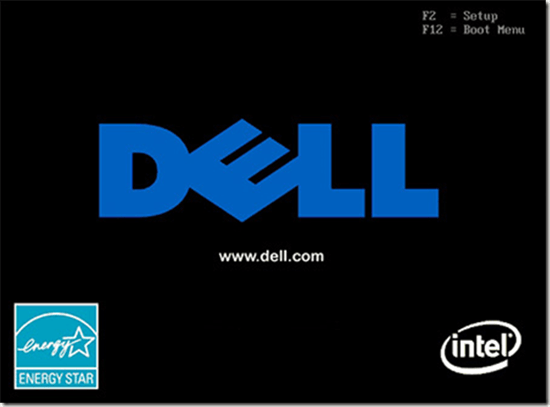 Power up your system and press [F2] at the Dell BIOS screen to enter the BIOS setup. Use the → arrow key to move to the advanced tab. Then press the ↓ key to take you down to the System Configuration and Press Enter. On the advanced tab press the ↓ arrow key to move to SATA Mode. Press Enter to modify the category between AHCI and RAID or other options such as IRST. Use ↓ and ↑ to select your setting and once again press Enter. Press [F10] to save changes and exit. Select Yes when prompted to Save Configuration and Exit. If you are using a system with a single SSD Boot Drive you are now ready to install Windows 10 TH2 on your new SSD. thanks for the additional information, are you talking about upgrading via DOS as mentioned here or forceit in an elevated command prompt? I changed laptops Hard Disk, and When I am trying to Instal Windows 7 or 8, after completion of Installation, When windows goin to setup Desktop, It show error in blue screen and shows error that Update BIOS, but I already have updated BIOS Version A11. I tried to update BIOS with A11 message is appearing can not flash BIOS with same version. I need to install Windows 7. Kindly suggest me What should I have to do. Before changing of Hard disk, I was using Windows 7. What model of Dell and did it originally come with Windows 7? Is this an Inspiron N5110? I’m having a similar problem installing a11 bios with an optiplex gx620. I’ve already installed windows 7 64 bit. I can’t find in dep Winplash.exe to turn off, is there an alternative file for this machine? No you may need to perform the update in 32 Bit Windows. Maybe you will need to even go way back to Windows XP in order to run the BIOS update. ya dear it workwd with 32bit os…i need more help…i m having too much issues with my notebook…..
1-mas storage controller missing…searched everywhere but failed to find…. 2-bluetooth neither detectable nor detecting any device…..driver installed from microsoft…made it visible…downloaded driver from dell support…but not installing….os system not supported error…. pls takeme out of tese problems…thank u so much for ur help…..
thanxx for your assistance..yesterday i went through this “http://o2micro-integrated-ms-mspro-controller.drivers.informer.com/download/5100” link….so after istalling this driver mass media controller driver problem and long beep problem on booting has been solved…but bluetooth problem still persists…i’ve installed bluetooth driver from dell…but not helping……having one more problem…i gave my notebook to a local repair centre..he theft wlan card from it…i checked on installing cmos batt….here in india it’s(model DW-1395) not available….i’ve samsung n150plus wlan+bluetooth card….whose socket is same as it….can i install that card in my dell….will it work….???? ya i did it….i placed samsung n150+ wlan card(broadcom) and installed driver from samsug website….and it’s working like a charm…. After several attempts to run (the download file will run, but extracts the actual flash program to c:\windows\temp\winphlash, and the winphlash.exe is a 32-bit only app), I found a place to download the 64 bit versions of the installers. No matter what version I tried, it failed for various reasons. After giving it some thought – I thought perhaps I should boot into a 32 bit operating system and run through this again. Having used bootable images in the past, I had some ideas as to where to look – but this is BIOS after all and I don’t want to brick the system. Long story short, Microsoft has the Windows PE bootable environment for IT administrators in various versions of Windows. I first had to download the Windows AIK package for Win 7, then went through the steps on their walkthrough page to create a 32bit (x86) version of the bootable ISO image, burned it to a cd… booted to it… changed to c:\windows\temp\winphlash and ran winphlash.exe with absolutely no errors or problems. It’s a long, cumbersome way to get there – but now I’ve got a bootable Windows 7 WinPE image, and it’s all legit. No copyrights violated. The laptop is great – still could use a battery but that’s okay… Running A06 (latest) bios and seems to be working well at this point. could not fknd the firmware image in memory. I am the same person who tried to help you on the Dell Community Forums. Dell Chris-M has replied to your post. He says that your CMOS chip is possibility damaged and that you may need to replace the motherboard. Better to leave it as is for now. I have a Dell E5530 with Windows 7 Ultimate. About once a year the screen goes blank, then the computer does an automatic BIOS update. I never get a chance to save my work. I called Dell, and they said this should never happen. The computer works OK after these automatic updates, but it works even better if I go back to the default BIOS. Can anybody tell me what is going on? Is there some way to stop these automatic BIOS updates? Where are they coming from? Thanks. I have a dell Insprion 14 3000 series, trying to drop a drive running vista from a older work laptop. I got a ACPI error. How do I fix that, and get it to boot from the old drive. You won’t get it to boot as the systems will have a completely different storage controller. You could do a repair install using a Dell Windows Vista Reinstallation DVD however if the license is OEM even if you fix the install and get it to boot then you will run into Microsoft Product Activation Errors. Windows Vista is obsolete and the Inspiron 14 3000 series should run better with Windows 8.1 (it should have a Windows 8.1 OEM license). That sounds like you have setup a BIOS password, you’ll need to call Dell Technical Support to help you with that. A BIOS Update should not set a BIOS password. Regardless the point in a BIOS password is to prevent the system from being stolen…. I cannot help you change this; you need to contact Dell Technical Support, verify your identity and there may be a charge for them to give you a master password to unlock it. ok thank’s it’s not stolen i will contact dell …..
One thing before contacting Dell, have you tried a blank password? Contact Dell if the system has warranty (after the warranty expires it may be costly to get support). You can also try dismantling the system and removing the CMOS battery to see if it resets the BIOS setup. Otherwise you may just want to leave it; theres usually very little need to change the settings in the BIOS setup. hi i have dell laptop 1525, i formatted it and installed a windows 7 installation for dell laptop 32 bit, everything wend fine i have A13 bios on it so i don’t know if i need to update it or not? now my question is, after windows come up i have all drivers updated wireless working sound camera touch pad and even modem got the driver but there are 3 unfamiliar hardwares on the computer manger that i don’t know what are they, and Bluetooth is not working (no any driver installed on it during the windows 7 installation). and if i need this pc only for some programming in c language and some hd movies to see (i have a hdmi output never tried it yet) is it enough? or should i buy more RAM? (i have another external HDD of 1TB so nvm the HDD). Theres not too much point getting a MX200 for this model as it doesn’t have the capabilities to take full advantage of the speed. i saw that i have all drivers installed also the sd card reader and the wireless lan card and the 3g modem tochpad and camera only the bluetothe is missing but what are the other 2 devices? Another question, now I have is windows 7 professional 32 bit should I upgraded bios on it and then upgrade to a 64 windows 7 Ultimae? hey will a16 bios work with dell inspiron n5110 and will it support windows 10…….. There is no A16 for that model. A11 will work if you ignore the silly Microsoft Get Windows 10 App which flags up bogus errors. I have Dell Inspiron 14z 5423 with Windows 8. BIOS is A6, I downloaded BIOS A13. But when I run it by administrator user, my laptop is not run and I hold power button to shutdown my laptop. With A8, A10, A12 are the same. What is your model? They are all marketed as Inspiron 3000 series but each model has a different 4 number code e.g. 3xyz? Its latest BIOS is A11. The Get Windows 10 gives a warning on this model but the warning is nonsense and can be ignored. Update to A11 on Windows 7 before trying to install Windows 10.
i have inspiron 14 3421. somehow i have the present win8.1 in legacy mode. so, i checked by going to bios set up – to see if my machine has uefi and secure boot. so, i am assuming, i will be able to select uefi, secure boot when i clean install win10 TH2. am i correct, philip? I have an Inpiron 14z 5423 that shipped with Windows 8 x64 installed on its 500GB HDD, using a 32GB mSATA SSD as a cache drive for Intel Smart Response and Intel Rapid Start Technology. I manually downgraded to a clean Windows 7 using an OEM Win7 x64 DVD and I left the caching setup the same. Disks are both GPT. In my current UEFI BIOS (latest, A13) settings I have the SATA setting set to Intel Smart Response, Intel Rapid Start Technology is set to enabled, and Secure Boot is disabled. I would like to do the following two things – replace the 32GB mSATA with a larger one and get a clean Win10 installation on the new SSD. I think I’ve read elsewhere the largest SSD this mSATA slot will recognize is 256GB, so I’d get a Samsung 850 EVO 250GB (I hope it’s dimensions are compatible?). I’ll leave the HDD for storage. With an SSD boot drive, caching will be unnecessary so I won’t need Intel Smart Response Technology software and in BIOS I should change the SATA operation to AHCI. Also I should enable Secure Boot. I’m less certain about the setting for Intel Rapid Start. Should I leave that enabled? I thought Intel says that it is helpful even in non caching setups? Also, do I have a chance at doing the clean install without upgrading to Win10 first? I made a Win10 USB with the media creation tool directly (not saving .iso and using Rufus) – it should be bootable for a GPT install? Also, I wonder if my Win8 product key is still embedded in my BIOS? No need to upgrade with the TH2 media, old documentation stating a mandatory upgrade refers to TH1 media. It should be compatible for a GPT install when the Media Creation Tool is used direct. Check the file format of the USB, if it is FAT32 it should be fine. Enable SecureBoot and disable Legacy Roms. These settings will work best for Windows 10 TH2. Did you manage to complete the update? Best to post on the Dell Community forums (Desktop/Laptop general hardware). Hello. I have an Inspiron 1720 in June 2008 with 2009 updated BIOS A9 not the version of 2011. Is possible to switch to UEFI BIOS with the 2011 A9 update or other version. 2 HD da 160gb a 7200. That’s a Mid 2007 model. Theres absolutely no chance that systems Legacy BIOS Update has UEFI support. A9 is A9… released on the 14th of July 2008. The date updated is a date that Dell Drivers and Downloads got updated and theres no change to the Legacy BIOS Update. The A9 file itself is identical. I have upgraded to Win10 Pro 64 bit. Is it possible to upgrade the BIOS to UEFI ? If yes, how ? No that system does not support UEFI. Reading the acronyms definitions at the beginning and coming to understand how the OS serial is phisically linked to the motherboard when using UEFI BIOS, how can I set up my computer to have a “Ultra Fast Boot “again if I had to change my motherboard through Dell due to hardware errors? I have a Inspiron 7520 SE running the latest BIOS version (A11 20/02/2014). It should have the fast boot if UEFI and SecueBoot are enabled. My dell inspiring 15 3542 doesn’t boot up. It gets stuck on dell logo after loading screen. I have Windows 10 home updated from Windows 8.1 . I passed out the dell hardware diagnostic. I didn’t found any error in that test. My Laptop has UEFI system. What will be the problem ? Why it is not booting into my Windows ? My dell inspiron 15 3542 doesn’t boot. I’ve done with the Dell Hardware diagnostic.I passed out in those with no errors. I am running on UEFI system. I have Windows10 Home updated from Windows 8.1. My laptop has 500GB of hard disk and 4GB of RAM.I also tried F8 but it doesn’t work. Why I am not able to boot into Windows ? Please give a solution for these as soon as possible. If you haven’t updated your UEFI BIOS to the latest revision before Upgrading to Windows 10… then you will need to Download a Windows 8.1 .iso. Clean Install Windows 8.1, Update your UEFI BIOS and then retry a Windows 10 TH2 Clean Installation. This needs to all be done before Friday. I have a latitude d630, it was pre-installed with windows 7, I upgraded it to 8.1, which was successful. After some weeks I installed windows 7 ultimate. I updated my BIOS to A19, and everything was working fine. I adjusted some settings in the BIOS setup, and I tried reinstalling. This time, the installation stopped at 93%. I stumbled on your site and I know you can be of help to me. The system should have came with Windows Vista OEM and not Windows 7 OEM. However since you bought Windows 8.1 (assuming a retail license) you are best to use your Windows 8.1 product key to clean install Windows 10. I have tested Windows 10 on a Latitude D630 and it works fine. In the BIOS setup CPU No-eXecute support must be Enabled. This is an old guide of mine (the free upgrade path has now expired) but I outline the Legacy BIOS setting in a Dell Latitude D820, the setup should look near identical in a Latitude D630. please why is my comment not appearing? my question dell n5010 is support or not??!!! and if supported what is the solution?? That system is a Mid 2010 Model with a 1st generation Intel Processor. UEFI became standard in about 2012 on 3rd generation Intel Processors. Some 2011 Business models with 2nd generation Intel Processors were updated to have a UEFI Boot. That model therefore shouldn’t have a UEFI Boot. I have a Inspiron N5050 laptop with A05 BIOS. Dell does not provide any higher version of BIOS than this. I had 32-bit win7 preinstalled which I had upgraded to 32-bit win10 a year back. Now, I wanted to do a clean install of win10 64 bit as I was facing some problems with the previous installation. I have created a bootable USB with rufus, but the USB is never detected during startup. A05 BIOS does not support UEFI, nor secure boot. Can you help me do a clean install of win10 64-bit? That is an older system, if you’ve made your Bootable USB with Rufus make sure you use the MBR Partition Scheme for (Legacy) BIOS as your system has a Legacy BIOS only and will not recognised a Bootable USB configured to use the GPT Partition scheme for UEFI. One beep at start: BIOS ROM checksum in progress or failure. Symptoms: System board failure, covers BIOS corruption or ROM errors.